A deeper look at the grooves pressed into the Visions LP by Able Baker Fox. 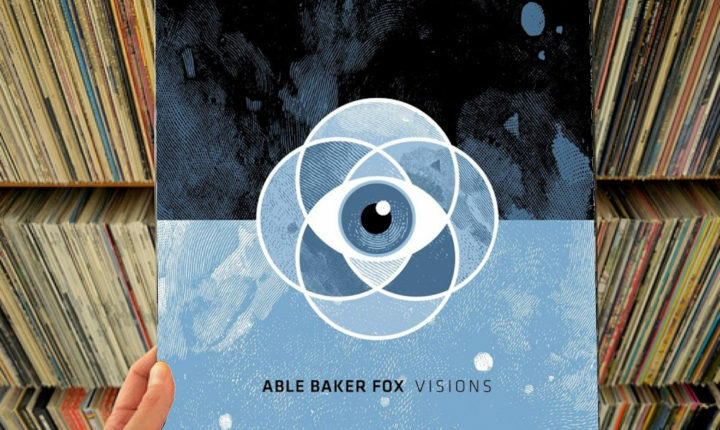 The first thing that Visions, Able Baker Fox’s first album in ten years, proves is that even if a type of music has fallen from popular fashion in recent years, it can still re-emerge sounding both fantastic and timely if there’s passion powering it. Right off, as soon as “Purple Mountains”kicks the doors open on the A-side of Visions, listeners who once felt a genuine connection to such classic emo acts as Breather Resist, These Arms Are Snakes and Despistado will instantly be transported to a moment when they were pretty sure that it “just couldn’t get any better than this.” The guitars laid down by Nathan Ellis and Mike Reed split their time between amazing and flabbergasting listeners thanks in no small part to the duo’s heavy but delicate and poppy performances, and the way they weave around Ellis’ vocals is truly a thing of beauty. Here (for the first time in however many years it’s been since everyone cared about emo), the clash between the band’s punk power and Ellis’ fine melodies driven both powerfully and unrelentingly by Ben Reed’s bass and Jeff Gensterblum’s drums is all the hook the song needs and, after it has done its hing for the entirety of its three-minute, twenty-second duration, listeners who missed emo’s glory days held dearly and left with a taste for more. As Visions progresses, they’ll find that they will not be left wanting. After “Purple Mountains” lets out, ABF does not let the energy level set by “Purple Mountains” lapse for even one second. “Sins Of Dad” revisits the old “Dad fucked me up but-good” plaint, but ages it enough to include a whole new generation (now, the children of those the singer’s age have begun to catch some of the fall-out) which puts a new crushing and cathartic spin on the thread and proves to be really cool. After that, a perfectly pogo-ready bass figure is contrasted with a really sinewy and faraway-gazing guitar part in “Painted Shell” (where Ellis wonders how simple things got so hard as he intimates that he feels for listeners who “want to be more than you are right now”) before the band winds up and pitches a truly perfect example of everything emo was in its prime with “Can We Be Honest” to close the side. There, while it could be easily contended that there really isn’t any new ground broken for the genre between the blood-thirsty bass part, lonely and isolated guitars which run through the verses (and become caustic for the chorus) and the “brave enough to not be beaten down” vocals, it could also correctly be argued that no one has done it as well as this since Alexisonfire battled its way through Crisis either. Simply said, the power and passion is so pure and potent here that it can effortlessly win converts to Able Baker Fox’s ranks, including more than a few who may have left emo behind after the sun set on the first wave of bands years ago. The way “Can We Be Honest” closes the first side of Visions, that there won’t be any listeners who are disinterested in flipping the disc to find its B-side is guaranteed -but they might not be expecting what the flipside has in store for them. Right off, the growling and angry bass which opens “Pennies On The Dollar” will inspire sneers on lips and sparks of violence to appear in the eyes of listeners, and “Long Horizon” follows that anger will a healthy dose of good, old-fashioned disillusionment (as evidenced by the choral rejoinder, “Tomorrow is best left uncertain”). Comparatively, while there was precisely nothing wrong with the A-side of Visions, it feels like there’s more meat here on the B-side; the A-side had some power, but the B- has fury to go with it which will cause a few old wounds thought long since healed over on some listeners to reopen wide. That is not meant to imply that the album may do damage to those who listen necessarily, just that some of those who do may remember that the catharsis of music like this helped to salve some wounds once but also occasionally open knuckles. Visions is out now in limited numbers of different colors of vinyl; 500 red, 200 pink/black and 300 white. Find red here (directly from No Sleep Records), and pink/black as well as white here (as imports).